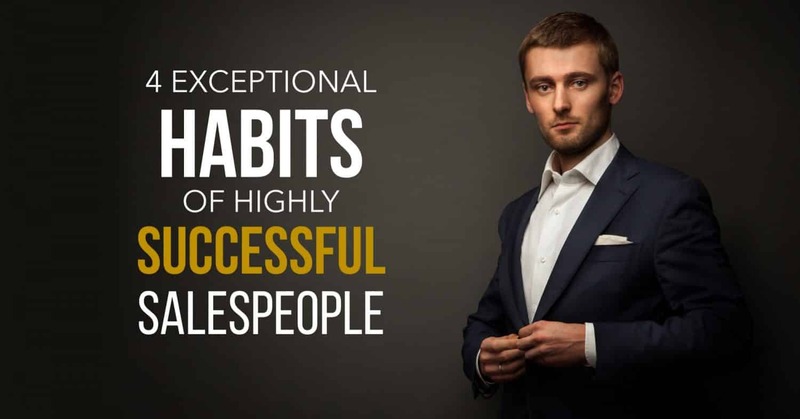 4 Exceptional Habits Of Highly Successful Salespeople | xPotential Selling Inc.
Knowing and applying these four habits can put you into a select group of superstars. One of the questions I get asked most often is, “What does it take to be a great salesperson?” Some ask because they want to be great in sales. Others ask because they want to hire great reps. Either way, successful salespeople leave clues to their achievement. Here are the four habits that I see consistently in top performing salespeople regardless of their industry. 1. Successful salespeople sell with a “business focus” instead of a “product focus”. They see themselves as an expert advisor to the key decision-maker in a business or department. They focus their conversations on understanding how their service offerings can help the customer achieve their business objectives, rather than having superficial conversations about their product. Tip: Read your prospects LinkedIn profile “Summary” to see what their view of bringing value to their customers is all about. 2. Successful salespeople have a “consciousness of flexibility”. Self-awareness is a key attribute of top salespeople. They are not workaholics. Instead, they take a measured approach to their career with sober judgment. They live by priorities instead of reacting to life. They know life is not rigid, but rather fluid and they accept that. They have a “consciousness of flexibility” which is a mindset enabling them to forge a chosen life path and still respond to personal and professional surprises creatively, without going into an emotional tailspin. Tip: Leave 20% of your schedule open so you have built in flexibility for the unexpected. 3. Successful salespeople sell their products and services framed by their customer’s perception of value… not their own. They know their own perception of value can be quite different than the customer. They keep their perceptions in check and position their solutions to match what is important to the customer. Tip: Have a set of written questions prior to your sales call that focus on uncovering the prospect’s perceptions of value. Regardless of their success, top salespeople always remain committed to consistent prospecting, building depth in accounts, tightly qualifying new opportunities, understanding a prospect’s value perceptions, making on-target sales presentations, preserving margins when negotiating, and completing the details of closing the sale. Tip: Always conduct thorough pre-call planning and qualifying to ensure you’re always prepared and that you’re never attempting to sell to an unqualified buyer. Whether hiring new sales reps or developing incumbents, look for these four habits that typify great salespeople. An in-depth sales assessment can reveal these traits to help you acquire premium sales talent or know what to work on with your existing team members. Using these four items as your guide, you’ll end up with more sales and more customers.